You may have heard about ways to clear clogged drains – but are all of them useful? Did they help to clean all drains? And what about seriously clogged drains and a clogged toilet? Is there any successful way to unclog drains? Yes, there definitely is! And this is what the whole page is about. We took the chance and pulled together the top 10 most succesful ways to unclog drains (clear clogged drain). We wrote a detailed paragraph on each way to clear clogged drains in order to help you clean drains on your own – without calling the plumber straigt away. But always keep in mind: If you experience serious problems or if you are completely unsure what to do next – please call a plumber and ask for a professional solution to clear your clogged drain. Clogged drain on regular basis? Some sinks and drains definitely need a lot of attention. The one in our house is the bathtub drain. This one is clogged every month and if this happens you need to unclog the drain. Within this chapter we will show you the quick fixes that work out fine most of the time. So here come the most successful ways to clean clogged drains (to unclog drains). Click on the tips below or scroll downwards in order not to miss an important one of these top 10 household remedies. A very easy and effective solution to clean drains is the so called plunger. This one should live in every household as it is the plumber’s best friend. The plunger is extremely reliable when it comes to seriously blockaged in a drain and it will help to clean the drain in seconds. Before starting to use the plunger on the drain please keep in mind that there should be enough water in the drain for cleaning. The plunger causes an underpressure in the drain and makes the water move up and down. The movement helps to release the blockage and cleans the drain. So please put a glass of warm water in the drain prior to using the plunger. Also important: If there is an overflow on the sink, shower or bathtub then please make sure to fully cover it with wet toilet paper or a washcloth in order to prevent the air (caused by pumping with the plunger) to escape through the overflow. After the above please try to completely cover the drain with the plunger so that the plunger can develop its full pressure. Also please fill the sink, shower or bathtub with water until the red (rubber) part of the plunger is fully covered with water. This makes it much easier to clear clogged drain. 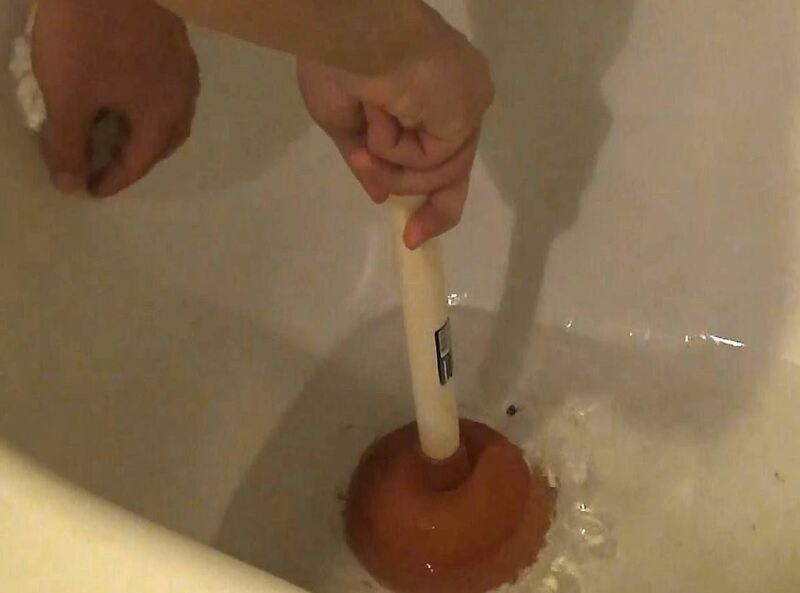 You should then start to slowly push and pull the wooden handle of the plunger up- and downwards while keeping the drain covered by the red suction cup. If this does not help please move the handle faster to put full pressure on the blockage in the drain. Repeat this process until the drain is unclogged. By the way: This describes how a plumber would go for the blockage in a first attempt. So the plunger is also named “Plumber’s Best Friend” or “Plumber’s Helper”. If you do not have a plunger or a drain snake at hand and need to clear a clogged drain (or a slow-moving drain) immediately we do have an almost for-free-alternative for you. Try to find a plastic bottle (e.g. a water or Coke bottle) with a minimum size of 0.26 to 0.4 gallons. Make sure that the bottle neck covers the whole opening of the drain to release its full pressure. If the sink, shower or bathtub is equipped with an overflow please make sure to fully cover / seal it with a piece of wet cloth or some duct tape. If you checked all the above please fill the bottle with hot water and firmly press it down on the drain. Now squeeze the bottle (from the bottom of the bottle) to release the water into the runoff. The pressure you produce with the water will help to clear clogged drain. If the first try did not fully unclog the drain please give it another chance. Sometimes you will need five to ten repetitions to clear the drain. When one of your drain is stubbornly blocked you need something more professional than a plunger or water bottle to clean that drain. The one explained in this paragraph you can buy in a hardware store around the corner. It’s a so called manual drain snake – sometimes also named spirale or spindle. The drain snake is commonly used when the clog does not live in the P-Trap / S-Trap / siphon but a little bit further down the drain – e.g. in the drain pipe within the wall. This one is made for seriously blocked drains. If you have bought it than carefully insert it in the drain you want to unclog. (Some drain snakes come with a separate crank you have to attach.) Right after you inserted the drain snake into the drain start drilling straight away. The spring steel cable will drill constantly and will reach almost every part of the drain pipe. Move the cable further down while drilling until you reach the clog. Drill a bit faster to destroy the clog. After you have attacked the clog once please put some water in the drain for testing. Repeat the drilling again and again till the clog is removed and you cleared the clogged drain. Not only for the removal of rust and paint a steel brush can be used. When you have one of the special pipe brushes at hand it will make your life and clearing of clogged drains much easier. Those specialized brushes to clear clogged drain look pretty much like a toilet brush – just downsized. The wire is extremely flexible (as you can see on the picture above) and can be pushed deep in the drain, P-Trap, S-Trap, siphon. Those pipe brushes can be bought in a DIY store. They are a environmentally friendly solution if you do not want to use chemicals to clear clogged drain. A steel brush / pipe brush can be used to tackle light but also strong drain blockages. They are made to remove lime deposits sealing the drain. But when the drain is extremely crooked or if there is a really severe blockage this wire brush will reach its limits. Then you should try one of the other top household remedies to clear clogged drain. Most of the times when you experience a clogged drain the clogged part is located directly in the P-Trap / S-Trap below the sink or bathtub. In this case there is another opportunity to clear clogged drain. If you can reach the P-Trap / S-Trap easily you can remove the whole part and clean it. This is quite easy and can literally be done by hand. If this does not work you normally just need a pipe wrench to unmount it. What else do you need? Definitely a bucket to put it below the trap as there is usually water in it that you can collect in the bucket without flooding the bathroom, kitchen etc. If you have to use the pipe wrench then please put a piece of cloth around the trap in order not to scratch it. When you managed to remove the P- or S-Trap please fully clean it inside. You can use a small pipe brush or your hands or a small claw. If you done the job and cleared the clogged drain just put the P-Trap / S-Trap back on. Please make sure to put all sealings back in the right place to make the whole drain watertight again. This is really important. Afterwards please make sure that there is no leakage! By the way: It might happen that the trap is in a very bad condition. If this happens you should consider to fully replace it straight away before you try to clear clogged drain. If the above tips do not work for your clogged drain you might choose number 6 to get your clogged drain cleared. This truly isn’t a typical one and needs much more attention but you may want to give it a try. If you have a garden hose in your household you just need to connect the garden hose to a pipe or tap that is close to the drain you want to clean. Now cover the drain with a piece of cloth and put the end of the garden hose into the drain you want to clear in order to route the full water pressure into the drain. Within a few seconds you will see if the clog will move or not. If you are not sure better stop the process in order not to damage the p-trap or s-trap. So please bear in mind: Make sure that there is no leakage in the drain when you put high water pressure into the clogged drain. This tip might help to clean drains but always be careful when working with a garden hose inside the your house… So please be careful if you try to clear clogged drain this way. Ever heard about to clear clogged drain with baking powder and some vinegar? Sounds like a new recipe and not like a household remedy to you? Ok, might be. But lets give it a try if all of the above do not help to clear clogged drain. So if you are careful in what you are doing you might find a solution if you mix some baking powder with vinegar in your drain to clear clogged drain. So here is how to do it: Put approximately four spoons of baking powder in the clogged drain. Afterwards immediately bring a 1/2 cup of vinegar into the drain. The mixture should now start to bubble for a while. You might also feel some heat in the trap – so be careful. When the noise stops you should flush the drain with hot water. Did this help to clear clogged drain? In some case it helps – in some it doesen’t. And always be careful. Never put too much baking powder in the drain as this may cause an even worse clog in the drain. If this happens you should consider a drain cleaner product. You may have also read about people putting coffee grounds into drains to clear clogged drains. We will not go into further details as this tip definitely does not work at all. I may furthermore generate really serious clogs in drains so that you may have to call a plumber and ask for help. This will be very expensive. So please refer to the other tips above if you really want to clean clogged drains! Again: Please do not put any coffee grounds in your drains – even if you have read about it as being a household remedy to clear clogged drains. Ok, thats more or less it. But please learn more about specific tools and equipment to clear clogged drains and toilets or have a look at our article on drain cleaners. I really like your advice to unclog drains using a plunger. That is a simple tool, yet most of us don’t use it when we are unclogging a plunger. Do you have any other tips about unclogging a drain? I think that it really can go a long way to try and just keep it all clean in order to prevent clogs. I like your tip on using a plastic bottle to clear your drain. I would imagine that this would be helpful if you don’t have a plunger or drain snake handy. However, if the clog is too severe I would imagine that the best thing to do would be to call a professional to take care of it. I didn’t realize that you could clear drains by using baking soda and water. I can see that the properties the baking soda has would help push whatever is causing the drains out and help it move easier. I will make sure to give this a try. I appreciate you talking about how a pipe brush can be used to remove lime clogging your drains. It definitely makes sense that doing some research can help you find the best way to keep your drains flowing right. Personally, I would want to consult with a professional in order to get extra advice on how to help my training system do what it is supposed to. I had no idea that plastic water bottles could be used to clear out drains. My drain has recently gotten to be clogged which makes our morning routine difficult. I definitely think that we should find a professional that could clear it out completely. I think that what you had to say here about clogged drains are really interesting! Just like you mentioned, some sinks and drains need a lot of attention like your bathtub drain because they are constantly collecting things as you shower daily. When we first moved into our home, we had to make sure that all the drains were cleared and fully functioning. Thanks again for the tips, and I will make sure to clear out that drain every month. It’s really interesting that the pressure produced with the water will help to clear a clogged drain, if you use a water bottle. The drain of the shower in my master bathroom has been clogged for several weeks, and although we’ve tried several methods to unclog it, the problem keeps returning. I’m not sure if any more home remedies will do the trick. It would probably be most beneficial if we call a plumber to come and permanently take care of the issue. It is really insightful that there are specific tools that you have to use for blocked drains. This could make it really difficult and not helpful if you do it yourself. As my fiance and I look into fixing a blocked drain we have, we will be sure to find a professional who will know what to do. I like how you suggested put a glass of warm water in the drain prior to using the plunger. I have a clogged, dirty drain that needs to be cleaned. Thank you for the information on clearing clogged drains.